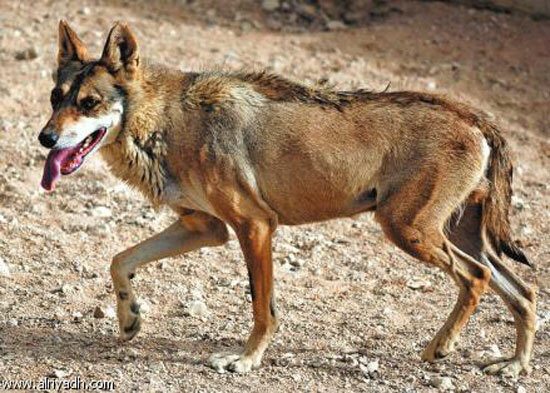 Standing approximately 26 inches shoulder height and weighing an average of 40 pounds, the Arabian Wolf is the smallest wolf subspecies, yet, the largest canid in Arabia. They have short greyish-beige hair which becomes much longer and thicker in winter. 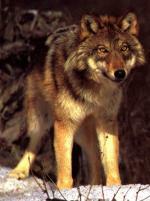 Their ears are large in comparison to the rest of it's body (similar to the maned wolf). Their eyes are naturally yellow with black pupils. However, many are found with brown eyes, revealing that somewhere down the line their ancestors have interbred with feral dogs. The Arabian Wolf Standing approximately 26 inches shoulder height and weighing an average of 40 pounds, the Arabian Wolf is the smallest wolf subspecies, yet, the largest canid in Arabia. They have short greyish-beige hair which becomes much longer and thicker in winter. Their ears are large in comparison to the rest of it's body (similar to the maned wolf). Their eyes are naturally yellow with black pupils. However, many are found with brown eyes, revealing that somewhere down the line their ancestors have interbred with feral dogs. It is endangered in Arabia, and extinct in the United Arab Emerites. Because of a scarcity of food, they are found in packs only during mating season from October to December, or when food is plentiful. It will kill animals up to the size of a goat, but usually feeds on carrion, small birds, rodents, reptiles and insects. It also eats fruits and plants when meat is scarce. 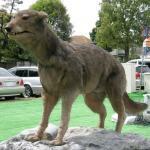 They dig burrows in the sand to protect themselves from the sun, and hunt mainly at night. 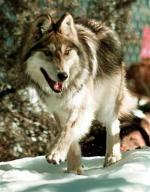 The only time that Arabian wolves are known to be territorial is when their pups are born. The litter size can be as large as 12, but is usually only 2 or 3. They are blind at birth and weaned at about eight weeks when the parents start regurgitating food for them.